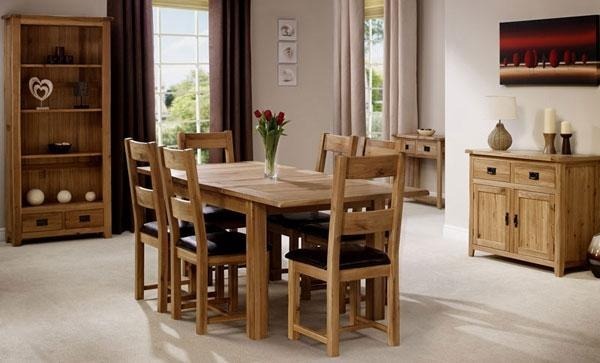 Solid wood furniture, no matter what year it was made, generally is classic, durable and relatively inexpensive. But trends do change. Sometimes that old piece of furniture needs an update to keep it fresh and modern. Here’s a primer on how to make your old wood furniture become the focal point of a room. Color is the easiest way to update furniture. You can highlight the more traditional aspects of a piece by staining the wood a natural color. Lighter colors are more popular right now, but a darker stain may be a better choice if your design aesthetic is on the formal side. For a trendy modern look, repaint the piece in a vibrant color or metallic finish. Try the shabby chic look for antique kitchen pieces, such as pie safes. Paint the item in a light pastel, and, if you want to maintain the vintage look, distress the finish by lightly sanding it. While you can make old furniture look new again by painting or staining it, you may be able to get good results by just making it shine. Clean the piece, let it dry and then apply several coats of polyurethane to the surface. This high-gloss finish is a good choice for pieces like sideboard buffets, because the polyurethane protects the wood against spills and stains. As you refinish the piece, use a fine-grit sandpaper to smooth down each coat before applying the next. Sanding eliminates tiny imperfections like air bubbles or dust that’s settled onto the surface. Pieces that are newly painted or stained also could use a coat of polyurethane for good results. Update old dining chairs or benches with new fabric. Modern floral prints or rich fabrics like velvet add elegance, and geometric shapes add interest. Decide on the look you want, and coordinate it with your paint or stain color. In many cases, it’s easy to remove the cushions on chairs and other similar furniture. Remove the old material, using it as a pattern to cut your new fabric. Attach the new fabric to the chair cushion using a heavy duty staple gun or decorative upholstery nails. If you have a large ornate table and no place to use it, consider resizing it. You can saw it in half and mount both pieces to a wall, creating handy surfaces for small items like telephones, plants, candles or decorative knick-knacks. You also can create symmetry in a room by using the table halves on opposite walls — a nice touch for formal dining areas. Not all wood pieces need to be used for their original purposes. Use an old wooden door to make a dining room table surface. Take the top off of a side table and add handles to instantly make a chic tray. Old dressers easily transition into new bookshelves. Just take out the drawers and replace them with smooth shelves, and you’ll have the fanciest bookshelf on the block. Ladders make great wrap-around shelving with a few wall fasteners. Wood furniture is versatile. It’s never too late for a piece to be updated — even those knotty pine chairs your parents had in the ’70s. Just add a little imagination and some elbow grease, and your old piece will become your newest household addition!